Malaysian film makers James Lee, Gavin Yap and Shamaine Othman will be directing a Malaysian feature film that audience can watch for free in YouTube. Read about it in theSun today. HISTORY will soon be made when KL24: Zombies becomes the first Malaysian feature film that audiences can watch for free in its entirety on YouTube. The project is the brainchild of producer and director James Lee, who has previously uploaded several of his short films on YouTube. “My shorts are not as popular as cat and baby videos but still, I am please with the growing number of people who are watching [them],” Lee said. 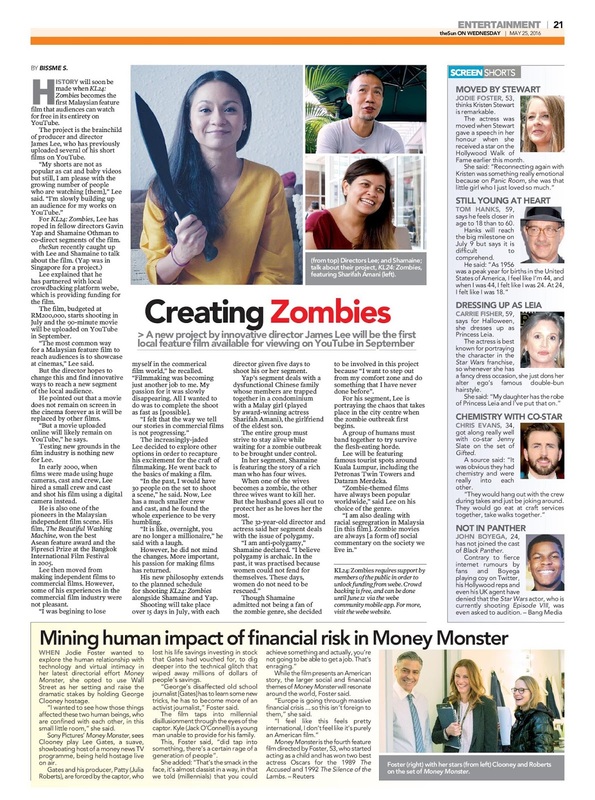 “I’m slowly building up an audience for my works on YouTube.” For KL24: Zombies, Lee has roped in fellow directors Gavin Yap and Shamaine Othman to co-direct segments of the film. theSun recently caught up with Lee and Shamaine to talk about the film. (Yap was in Singapore for a project.) Lee explained that he has partnered with local crowdbacking platform webe, which is providing funding for the film. The film, budgeted at RM200,000, starts shooting in July and the 90-minute movie will be uploaded on YouTube in September. “The most common way for a Malaysian feature film to reach audiences is to showcase at cinemas,” Lee said. But the director hopes to change this and find innovative ways to reach a new segment of the local audience. He pointed out that a movie does not remain on screen in the cinema forever as it will be replaced by other films. “But a movie uploaded online will likely remain on YouTube,” he says. Testing new grounds in the film industry is nothing new for Lee. In early 2000, when films were made using huge cameras, cast and crew, Lee hired a small crew and cast and shot his film using a digital camera instead. He is also one of the pioneers in the Malaysian independent film scene. His film, The Beautiful Washing Machine, won the best Asean feature award and the Fipresci Prize at the Bangkok International Film Festival in 2005. Lee then moved from making independent films to commercial films. However, some of his experiences in the commercial film industry were not pleasant. “I was begining to lose myself in the commercial film world,” he recalled. “Filmmaking was becoming just another job to me. My passion for it was slowly disappearing. All I wanted to do was to complete the shoot as fast as possible. The increasingly-jaded Lee decided to explore other options in order to recapture his excitement for the craft of filmmaking. He went back to the basics of making a film. “In the past, I would have 30 people on the set to shoot a scene,” he said. Now, Lee has a much smaller crew and cast, and he found the whole experience to be very humbling. “It is like, overnight, you are no longer a millionaire,” he said with a laugh. However, he did not mind the changes. More important, his passion for making films has returned. His new philosophy extends to the planned schedule for shooting KL24: Zombies alongside Shamaine and Yap. Shooting will take place over 15 days in July, with each director given five days to shoot his or her segment. Yap’s segment deals with a dysfunctional Chinese family whose members are trapped together in a condominium with a Malay girl (played by award-winning actress Sharifah Amani), the girlfriend of the eldest son. The entire group must strive to stay alive while waiting for a zombie outbreak to be brought under control. In her segment, Shamaine is featuring the story of a rich man who has four wives. When one of the wives becomes a zombie, the other three wives want to kill her. But the husband goes all out to protect her as he loves her the most. Though Shamaine admitted not being a fan of the zombie genre, she decided to be involved in this project because “I want to step out from my comfort zone and do something that I have never done before”. For his segment, Lee is portraying the chaos that takes place in the city centre when the zombie outbreak first begins. A group of humans must band together to try survive the flesh-eating horde. Lee will be featuring famous tourist spots around Kuala Lumpur, including the Petronas Twin Towers and Dataran Merdeka. “Zombie-themed films have always been popular worldwide,” said Lee on his choice of the genre. Footnote: KL24: Zombies requires support by members of the public in order to unlock funding from webe. Crowd backing is free, and can be done until June 12 via the webe community mobile app. For more, visit the webe website.